Greater China equity hedge funds: Is the bumpy ride over? Greater China equity hedge funds ended 2018 down 14.78% after posting negative monthly returns over the better part of the year as fund managers struggled to generate profits amidst the volatile market. The escalation of the US-China tariff spat, combined with the US Federal Reserve’s aggressive rate hikes throughout the year severely weighed on the equity markets across the emerging markets, and especially China. Difficult trading situation arising from the return of market volatility and equity market sell-offs resulted in substantial performance-driven losses for the managers comprising the region’s US$28.7 billion hedge fund industry. The Eurekahedge Greater China Long Short Equities Hedge Fund Index which tracks Greater China focused hedge funds utilising equity strategies recorded its worst yearly return since the 2008 global financial crisis last year, immediately after ending 2017 up 31.47% on the back of the underlying region’s equity market rally. Going into 2019, the index managed to gain 8.31% over the first two months of the year, supported by the recovering risk-on sentiment among investors following the Fed’s dovish stance since January. The progress of the US-China trade talks has also raised the market’s optimism over a potential resolution for the ongoing trade war which has driven investor capital out of the Chinese equity markets. These much needed tailwinds propelled the region’s equity markets over the first two months of the year, as seen from the 21.88% and 10.79% year-to-date gains of the CSI 300 Index and Hang Seng Index respectively. On the other hand, increasing worries over slowing economic growth may pose a challenge for the country’s equity markets in near future, potentially necessitating additional policy supports from the PBOC. Apart from that, following the recent fiasco surrounding Huawei, concerns have been raised over the possibility of politically-motivated foreign government actions to curb the growth of Chinese companies which may undermine fund managers’ performance forecast based on fundamental and quantitative factors. Nevertheless, a volatile trading situation may present valuable opportunities for skilled hedge fund managers to generate excess returns and distinguish themselves from their peers, as exhibited by the 10 best Greater China equity hedge fund managers who outperformed the MSCI Golden Dragon by 23.11% on average in 2018. Figure 1 below illustrates the performance of the Greater China equity hedge fund managers since the end of 2009 compared to their regional peers across Asia, as well as the underlying equity markets of the country as represented by the CSI 300 Index which tracks 300 large cap A-Share equities in the Shanghai and Shenzhen stock exchanges, the Hang Seng Index which represents the companies listed in the Hong Kong stock exchange, as well as the MSCI Golden Dragon IMI, representing the wider Chinese equity market. As the figure above shows, Greater China equity hedge fund managers generated an annualised return of 6.10% since the end of 2009, better than any of the equity indices used as benchmarks. These fund managers successfully hedged themselves and suffered smaller losses during periods in which the underlying region’s equity markets were taking a beating, and still managed to capture their upward rallies. For comparison, the CSI 300 Index posted an annualised return of 0.28% over the same period, while the Hang Seng Index generated 2.98% per annum. The MSCI Golden Dragon IMI (Local) returned 3.00% per annum since the end of 2009. The Eurekahedge Greater China Long Short Equities Hedge Fund Index was up 8.31% over the first two months of 2019, supported by the underlying region’s equity market rally which resulted from investor optimism over the US-China trade negotiations and the Fed’s dovish stance. The CSI 300 Index gained 21.88% as of February year-to-date, recovering a significant portion of the losses it suffered last year. On the other hand, the Hang Seng Index and MSCI Golden Dragon gained 10.79% and 12.87% respectively over the same period. Hedge fund managers focusing on Greater China equities slumped 14.78% in 2018, recording their worst year post-crisis as the US-China trade tension and aggressive Fed rate hikes throughout the year weighed on their returns. The CSI 300 Index representing large-cap companies listed on the two mainland exchanges suffered a 25.31% decline during the year, while the Hang Seng Index and MSCI Golden Dragon declined 13.61% and 16.32% respectively. Looking over the last two years, Greater China equity hedge funds generated a Sharpe ratio of 0.46, which is noticeably better than the Sharpe ratio generated by the CSI index, but roughly similar to those of the Hang Seng and MSCI indices. Looking at Sharpe ratios over the last three and five year periods, the Eurekahedge Greater China Long Short Equities Hedge Fund Index trailed behind the Hang Seng Index and the CSI 300 Index respectively. Compared against their global peers, Greater China equity hedge fund managers typically generate better returns, albeit at the cost of having higher volatilities. The Eurekahedge Long Short Equities Hedge Fund Index underperformed Greater China equity hedge funds in terms of 2-year Sharpe ratio, but fared better over the longer periods of three and five years. Greater China equity hedge fund managers posted a -23.82% maximum drawdown over the last five years, which is well below those of the underlying equity market indices, but also noticeably behind the -8.72% posted by the broader long short equities mandate. Table 2 provides the correlation values between the performance of Greater China equity hedge fund managers and the underlying equity market indices over the period starting in December 2009. Figure 2 below provides the 12-months rolling alpha of the Eurekahedge Greater China Long Short Equities Hedge Fund Index versus the three underlying equity market indices, assuming a risk-free rate of 0%. The recent volatile market situation had negatively impacted Greater China equity fund managers’ alpha against the equity markets, as shown by the quickly declining alpha since the end of 2017. Over the entire period starting from the end of 2009, the alpha generated by Greater China equity hedge fund managers stood at 0.13% against the CSI 300 Index, 0.16% against the Hang Seng Index, and 0.15% against the MSCI Golden Dragon. Figure 3a and 3b below provide the breakdown of the Greater China equity hedge funds based on their alpha and beta against the MSCI Golden Dragon since the end of 2009. 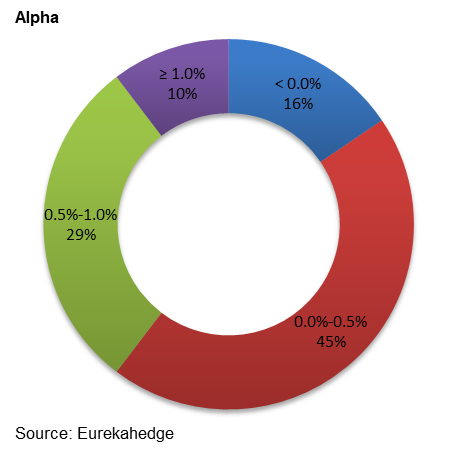 Roughly 16% of these fund managers failed to generate any positive alpha, while on the other end of the spectrum, around 10% of them managed to generate alpha in excess of 1%. Looking at the breakdown based on beta value, we observed that nearly half of the Greater China equity hedge funds tracked by Eurekahedge have beta levels between 0.5 and 1.0 against the MSCI Golden Dragon. It is pertinent for hedge fund investors to not only pick the fund managers that generate good alpha, but also choose the right amount of systematic risk level they are able to, or willing to undertake. In Figure 4 the breakdown of the Greater China hedge fund industry’s asset flows on an annual basis is illustrated. The region’s hedge fund industry asset currently stands at US$28.7 billion, marginally up from the US$28.0 billion figure by the end of 2018. The Greater China hedge fund industry asset base grew rapidly between the end of the global financial crisis and 2015, before slowing down in the recent years. Hedge fund managers focusing on the region were hit particularly hard by the aggressive Fed rate hikes and the US-China trade friction in 2018, as indicated by the US$2.3 billion of performance-based losses recorded during the year. Despite that, investor allocations toward the region remained robust, as the industry saw US$1.0 billion of net inflows in 2018.